If you’re in the market for a mortgage, and have less than a 10% downpayment, then you might want to get that mortgage before June. Canada Mortgage and Housing Corporation (CMHC) is raising premiums for insuring mortgages on Canadian homes with less than 10% down. The new premiums are about a 15% increase. Canadian homebuyers are required to have mortgage insurance if they have less than 20% equity in their homes. Premiums are not increasing for those with downpayments of 10% or more. How does it hit your wallet? A homebuyer can expect to pay an extra $450 per $100,000 in mortgage. I can calculate exactly how much the increase will mean to you. The change will come into effect on June 1st. Homebuyers will be able to access the current lower rates if they have bought a home and are approved before the June 1 deadline, even if they have a later closing date. If you've got less than a 10% downpayment and are looking to buy, get in touch today! Wouldn’t spring cleaning be so much more gratifying if – somewhere under dusty barbecue parts and outgrown hockey skates – you found an envelope with, say, $5,000 in cash? Wouldn’t that make spring cleaning worthwhile? Well, you may not uncover a financial windfall when you’re cleaning the garage this spring, but if you are continuously carrying a large amount of high interest debt, a little time and attention to the task of spring cleaning that financial clutter can be very rewarding. If you have enough equity in your home, you have a golden opportunity right now to give yourself a tremendous financial boost. By rolling your other debt into a mortgage, you can reduce the number of payments you’re making each month, save big on interest costs, be mortgage free quicker, and greatly improve your cash flow. Most of all, you’ll be able to start building wealth. Worried about penalties? Don’t think it can make much difference? Think again. It can be as good – or better – than finding the $5,000 envelope of cash in your garage. If your cash flow has slowed to a trickle because of your debt, I can analyze your situation and outline your spring cleaning options! Just how low are today's rates? 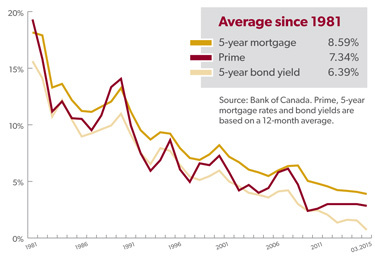 No one can predict accurately what will happen next when it comes to interest rates, although this comparison chart shows just how historically low today’s rates really are, providing a great opportunity for those looking to purchase, refinance or renew their mortgage.